There’s been an interesting movement that’s been quietly happening for quite a while now, but nobody noticed because we were all watching the continuing, unending debate between Christians and scientists about Creationism. This movement has been away from creationism, and has involved a majority of Christian scholars. For the past 80 years or so, there’s been a fierce public debate (that started decades earlier in the academic community) about creationism and evolution, and how they’re incompatible. Surely everyone imaginable has weighed in on this, but we usually only hear about two camps: American Young-Earth Creationists, who are themselves a subset of American Evangelicals, which is also a subset of a subset of a subset of Christianity; and the scientists who try to answer them. I’m not trying to frame this in a way to make Creationists look bad – there are some incredibly brilliant people who subscribe to this theory, and I think that everyone should be able to learn about it – but just to say that they’re a very small minority of the Church. And the scientists who still debate about creationism and evolution are getting fewer and more polemical – it’s getting down to the Dawkins types, who only engage in it because they like nothing better than to make Christians look ignorant and backwards, and they’re quite good at it. I should point out that, probably, a majority of Christians in the world still believe that God created the world in six literal days, that we all descend from Adam and Eve, etc. etc. This is a very understandable belief, and a very simple one – straightforward. It’s also true that most of them have never really examined that belief, or done textual studies on Genesis 1-3, or done biological research. But this article isn’t about what the average Christian believes, it’s about what Christian scholars believe – and it’s saying that Christian scholars, more and more, are not Young Earth Creationists. But that’s nothing new. The Catholic Church has always upheld the belief that all truth is God’s truth – which makes perfect sense. If it’s true, then, well, it’s true: there’s no such thing as something that is true that contradicts God, by very definition. I find it ironic that this statement comes from a group of people who grant the status of inerrancy to particular people, but hey, they’re right on this bit. If it’s true, and God is true, and yet it doesn’t seem compatible with our understanding of God, then maybe it’s our idea of God that’s wrong. Similarly, biblical scholars, for the most part, stopped reading Genesis 1-3 literally about a hundred years ago. There are still some holdouts, but for the most part, we’ve moved past literalist hermeneutics. It doesn’t do justice to the text, which is a brilliant composition that has particular form and content that was never meant to be taken literally in the way that we understand literal. It’s full of truth, and is thus a “true story”, but it’s symbolic, representative, typological, etc. In fact, it closely resembles the Egyptian and Mesopotamian creation myths – on purpose, to show something that’s true about God that those other myths missed. And don’t take “myth” to mean “untrue” or “primitive”, because it’s an actual genre of literature, with its own features, that doesn’t bear literal readings very well. A few years back, Bruce Waltke, revered Old Testament theologian and Evangelical, got canned from Reformed Theological Seminary because he said “if evolution turns out to be true, and we still deny it, then we’re denying God.” (Paraphrased). His statement, which sums up the attitude Catholics have had toward science for centuries, is unambiguously true – but it touched on a hot button. It should be mentioned that Bruce Waltke was likely already walking a tight line there due to his association with the abovementioned Biologos institute, and he’s probably better for the change; even so, it made a big statement to force him out over this issue. And finally, scientists who insist on Young Earth Creationism (a literal 6-day creation) are a minority even among Christian scientists. I’m not a scientist, so I won’t even get into that part of the debate; but even the scientists who still challenge the conventional line on evolution are not typically doing so from a Young Earth Creationism perspective anymore: they’ve moved on to Intelligent Design, or other theories. I’m not saying that anyone’s dumb for being a Creationist: we’ve been steeped in it forever, and there are some really, really good arguments out there. Personally, it’s been my understanding of scripture that has changed my mind. As I said, I’m not a scientist, so whether I’m reading creationist books or evolutionist books, I have to take their word for it (which renders the exercise pretty pointless, because I’m forced to believe whoever I’m reading at the moment). But when we read scripture, we can either force it into a scientific mold or we can take it on its own terms, and its own terms (in this case) are mythological, not scientific – which means that the whole creation/evolution debate is based on false premises. In that respect, it reminds me of the Hitchens/Blair debate this past spring: it was a debate that was founded on a secular humanistic understanding of religion. Creation/Evolution is founded on a scientism worldview, which forces us to see all things in a literal/objective/scientific light. Texts aren’t like that, and religion isn’t like that, and for the most part, life isn’t like that. I feel like all of our years trying to defend our faith against science, in a scientific debate, has done nothing except make us gluttons for punishment. That’s not to say that creationists don’t use science – this is a very common charge against them that is an unfair generalization – but only that we’re standing on Dawkins’ turf, and trying to beat him at his own game. There’s a better solution. I’ll close with one last thought, and I apologize if I’ve rambled. I read a book a while back called To Change the World by James Davison Hunter. I mentioned it here a few times. One of Hunter’s points is that we (the Church) need to stop being against the world, and actually affirm the good that exists in the world. We act as if God only works through us, or only in the ways that we understand and talk about in our small circle of the world, when in reality He’s out there, and there’s a whole lot of good things in the so-called “secular” world that bear His glory. Science is one of those things, and we ought to be taking part in it. Actually, most of us already are. Perhaps I should explain a bit about apocalyptic literature, to give some context to that statement. Strangely enough, none of those things are really like a comic book. Sure, a comic book has a narrative framework and often features a somewhat supernatural world, but that’s not really what makes it like apocalypse. Let me give a further description of apocalypse, and if you read comic books you may start to see the similarities. An apocalypse is usually written for a group of people in crisis. It describes historical events in fantastic, otherworldly ways that don’t make a lot of sense unless you know what they’re talking about; this is because it uses symbols and imagery to represent those events. By using those symbols and imagery, it makes it possible for the themes of their story to stand out, without getting caught up in the historical details that a more straightforward description might focus on. You see, we have a habit of reading a story – particularly a historical account – with an eye for specifics: we want to know who did what, when, to whom, and why. Unfortunately, when we read under a microscope like this, we often miss the more important themes that lie behind the details. But when you use metaphors for all of your characters and events, the microscope falls away: without details, we can see the big picture, and the true significance, of events. A central strength of Marvel Comics, and a reason (in my opinion) that they’ve fared so well vs. their rival comic giant, DC Comics, is that they understand the power of metaphor to describe things that we can all relate to. 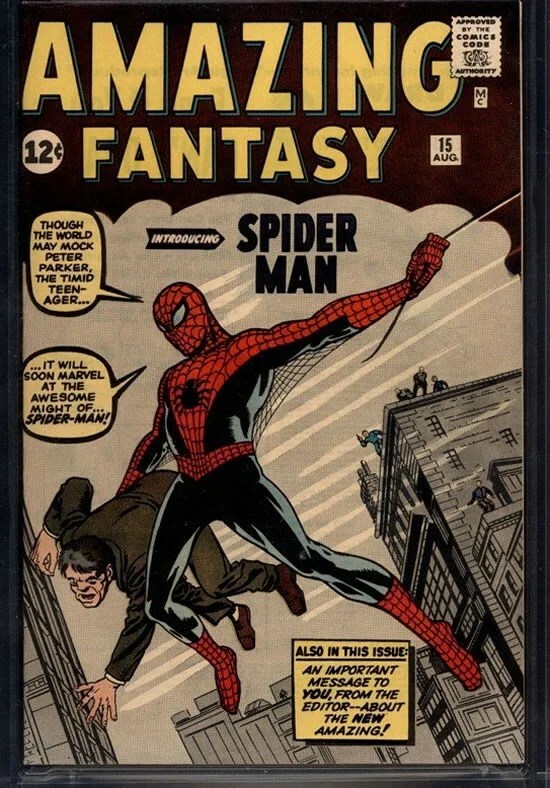 For example, take Spider-man – possibly the biggest name in comic books (though Superman and Batman have greater brand recognition, nobody sells comics like Spider-man). A regular, awkward, nobody high-school student, Peter Parker suddenly gains physical coordination, strength, and super-powers. He gains confidence, and eventually, the girl of his dreams (Mary-Jane Watson). Aside from the obvious hyperbole of the super-powers and their source (a radioactive spider bite), Spider-man’s tale is one we can all relate to: puberty. It’s just bigger and more spectacular, like everyone wishes their life could be. But it also has a timeless message: “With great power, comes great responsibility.” If there’s a better method of giving a pre- or mid-pubescent kid a sense of power and responsibility than giving them a Spider-man comic, it couldn’t be this much fun. But apocalyptic doesn’t just give people hope in a time of crisis: it also is a powerful tool of social criticism. Roman emperors are depicted as terrible beasts that demand worship and enslave the masses, slaughtering their enemies mercilessly. Rome itself is depicted as a whore, greedy for more money. And that’s just a few chapters out of Revelation! Comic books, or “graphic novels” as they’re now more respectably called, are incredibly powerful tools for social critique. 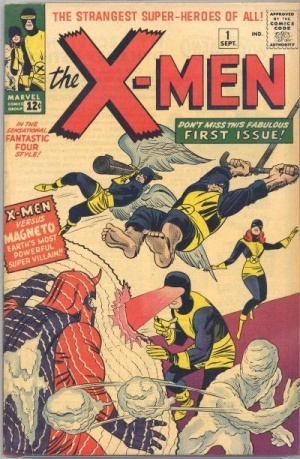 In the mid-60’s, Marvel came out with the first X-Men comics. The running storyline in X-Men is one of segregation, prejudice, and racial violence, mirroring the scene in the American South in the years f0llowing the end of segregation. The difference is that X-Men isn’t about white vs. black, but about the trials faced by mutants, human beings who have genetically mutated, in some cases granting them special powers. There’s still the whole message about using your unique power for good, as many mutants join either the good X-Men, or the aptly named Brotherhood of Evil Mutants, but the theme of racial tolerance and the brotherhood of all humanity, of all colours and mutant abilities, is what drives the series and all of its spinoffs. If we’d just read about Martin Luther King Jr., we might have been very inspired; but once you start bringing up historical specifics, you get caught up in the details, and the arguments, that can easily serve to dull the message. By using symbolic portrayals – mutants instead of people of other skin colours – we can distance ourselves from the details to let the themes shine through. No matter where you stand on racial issues, it’s difficult to read an X-Men comic and not see the mutant characters as human beings. Another fantastic example is V For Vendetta, which was an independent comic eventually released through DC, and made into a film a few years back by the Wachowski brothers (I highly recommend it). It portrays an alternate future, in which the US is a wasteland in the midst of civil war, and Britain is ruled by a totalitarian government much reminiscent of Nazi Germany. The similarities are blunt and obvious. What’s a bit more subtle is the similarities between this Nazi-like state and our own – subtle, but still apparent. The themes of resisting oppression are empowered by the similarities to Nazi Germany, but they are aimed at a third target: the situation we find ourselves in, whatever that situation may be. No matter where we live, and what party governs us, as soon as we see a similarity to V for Vendetta, our alarm bells start going off, and we know we must resist oppression before it starts. Apocalyptic does this very well. 4 Ezra and 2 Baruch, two Jewish apocalypses written in the first century AD, are both set around the fall of Jerusalem in 586 BC to the Babylonians. They use this setting of terrible destruction by external oppressors to comment on their real-life situation: the fall of Jerusalem in 70 AD to the Romans. In doing this, they create a “type,” a literary term we’re probably more aware of in a film context: when an actor is especially well known for a particular role, we say that they’ve been “type-cast” – because no matter what role they play next, we’ll always think of that first role, because the association is so strong. The image of the destruction of Jerusalem by the Babylonians is so strong that all subsequent attacks on Israel are compared to it – but most especially this attack by the Romans in 70 AD. Similarly, no oppressive regime in modern history has made more of an impression than the Nazis; so when V for Vendetta (or even Harry Potter and the Deathly Hallows) uses imagery that reminds us of Nazis, we’re immediately plunged into a sense of oppression and the need to resist. I suppose all of this is also true of the genre of Fantasy novels, but though they have very wide followings, they don’t have the mainstream appeal of comic books. I think that comics can be a powerful tool, and one that we ought to continue to develop. After all, the main point of ancient apocalypse is to give the people a message from God – and though our contemporary audience isn’t much interested in hearing from God, in their defense we haven’t exactly been delivering. The apocalyptists didn’t deliver new messages from God, but reinterpretations of the prophets. Let’s continue this tradition, delivering timeless messages in a modern way. I read Love Wins by Rob Bell, and I want to start by saying that at no point does Rob Bell suggest that Hell doesn’t exist, or that it’s anything less than the greatest horrors we can imagine. He doesn’t say that nobody will go to Hell, either. He doesn’t say that Hell is just a state of mind that exists in the here and now; he affirms that Hell can be such a thing, but that it is also an eternal state. He affirms the existence of Hell in every way it can exist. He doesn’t say that all religions lead to heaven, or that all religions are the same. He doesn’t say that holiness doesn’t matter, or that evangelism doesn’t matter. Rob Bell, believe it or not, is quite orthodox. So, if you’re coming to nit-pick his evangelistic pop-theology with a fine-toothed hermeneutical comb, leave it out. Now that the disclaimer’s out there, we can begin. This post has been a long time coming, but I’m hesitant even to write it. Even my announcement to facebook that I had read it brought a lot of controversy. If you’ve read this blog before, you know that I don’t usually shy away from controversy; but this is old controversy, and it brings up an unending conflict between fresh ideas and dogmatism. So I’ve decided to write about something else. I think I know why people get upset about this book, and the ideas it shares. I think it’s because it raises so many questions. On one hand, it’s funny that Christians get upset at asking questions, considering Jesus asked more questions than anyone. Questions were his primary mode of communication. On the other hand, it’s easy to see why Christians get upset about asking too many questions: questions can be dangerous. Questions can shatter worldviews, and with them, worlds. No wonder Jesus asked so many questions. One of the responses to my recommendation of Love Wins touched on an important subject: an old friend mentioned that this book could lead people astray (not his words, but that’s the gist). He suggested that people who know the Bible really well could read this book and not be confused by it, but that people with less biblical literacy could get the wrong idea. That’s an understandable concern; after all, Jesus said it’s better to wear cement shoes swimming than to lead someone astray. Actually, he said that about causing someone to sin, but the point I want to make here is that I think many of us don’t differentiate between the two: we see wrong beliefs as being just as bad as wrong actions. Does being wrong make me a sinner? If it does, I’m in good company. We differentiate between heresy and error for this very reason: error is to do with things about which you’re allowed to disagree (somewhat), but if you disagree about the important stuff, the central elements of the faith, then that’s heresy. Early Christians wrote creeds about the central things, so that they could clearly define what disagreements constitute heresy. Heresy has been punishable by death at various times throughout Christian history, and it’s always been assumed that heretics go to Hell. Oddly enough, even the creeds don’t talk much about Hell, and where they do they merely assume its existence; so though the nature of Hell has never been an issue of heresy or orthodoxy, strangely we still find that people see it as a deeply important issue upon which the fate of believers may hang. …or is it? Evangelicals say that it’s easily understandable by all. I’ve been taught that, and I’ve been saying that, most of my life. The message of salvation is simple: you must understand your need for salvation (because you’re a sinner, like everyone else); you must ask God for forgiveness (the gospel of repentance that Jesus preached); and you must trust that it is Jesus who provides your salvation, and that it is by grace rather than by works. So, basically, the message of salvation is the sinner’s prayer; except that scripture isn’t anywhere near that clear, and nobody said the sinner’s prayer until about seventy-five years ago (or less). And this is where I think the massive outcry against people like Rob Bell comes from. We Evangelicals preach a simple gospel that has our understanding of that simple gospel as a pre-requisite to salvation. If someone starts asking uncomfortable questions, people’s understanding of their salvation might waver; if their understanding of it wavers, does the salvation itself waver? We’d sure hate to find out! So Rob Bell should stop asking questions that could get people who are less educated in their salvation off the simple message, because if they waver off that track they’re lost forever, right? I sure hope not, and I really don’t think so. When you read the New Testament, you frequently come across the word “mystery”. The writers of the New Testament used all sorts of metaphors for what Jesus did to save us, and those metaphors don’t all exactly line up, but only because none of them quite captures what Jesus has done for us. The writers used metaphors and images because they can’t explain it themselves, and sometimes they simply call it a “mystery.” They were okay with ambiguity about what Jesus had done, because they knew that they didn’t need to understand it completely to know that it was accomplished, to know that it was good news. So if you have a beef with Rob Bell’s theology, that’s fine. If you want to debate, there’s plenty of room for that. But please, please don’t make people afraid of asking questions, even about central matters. Jesus certainly never did, and I’m sure He’s not going to damn us all to Hell if we get something wrong.